Katie Hutton is the Program Manager of Arts & Letters Live at the DMA. Every year I struggle to think of a creative new Halloween costume to wear. Oftentimes the month somehow escapes me and I end up recycling one of my old costumes: a cat, witch, or something with a mask. 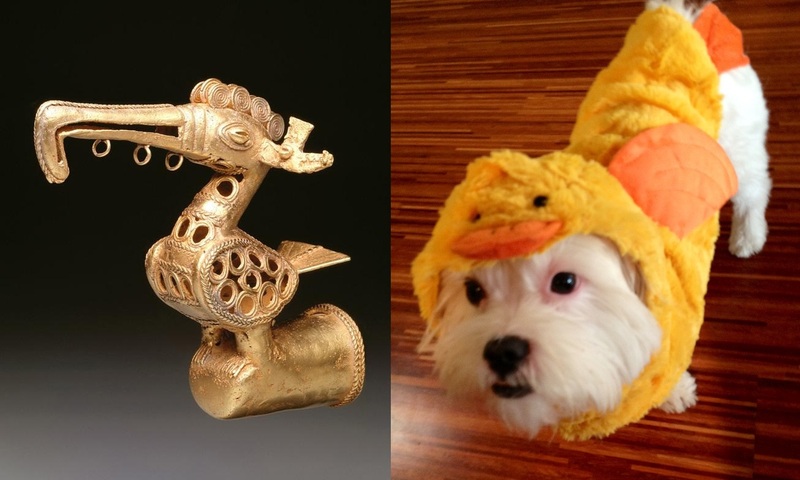 However, this year I realized that inspiration is all around me in the DMA galleries. 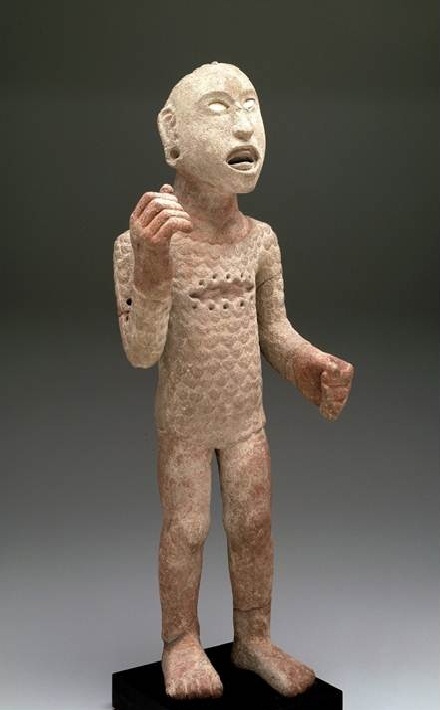 As I wandered through the Museum this month, I was flooded with images of myself as a fierce Hindu goddess with multiple arms, an affluent Asante chief covered with gold, or even a mummy wrapped in linen. Excited by all the endless possibilities, I decided to ask my fellow authors which artwork they would choose to base a Halloween costume on. 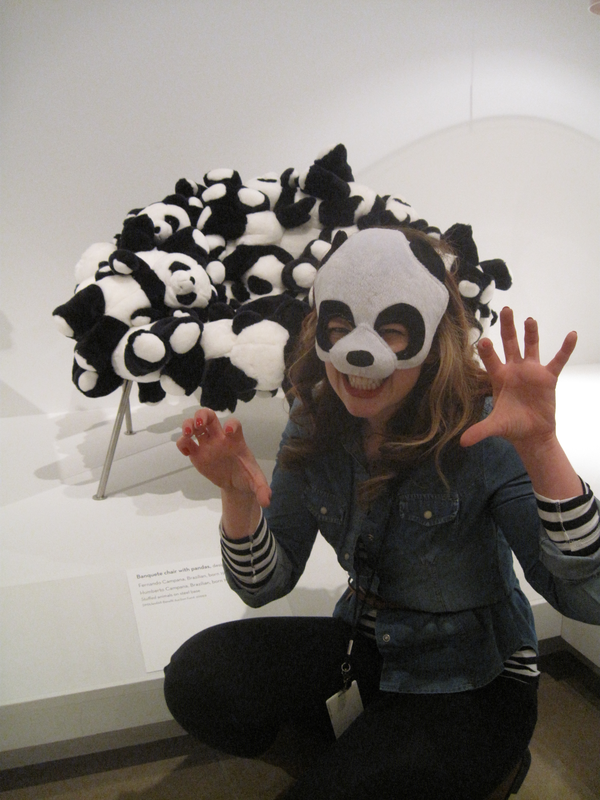 “Amanda Panda” drew her inspiration for a Halloween costume from the Banquete chair with pandas. 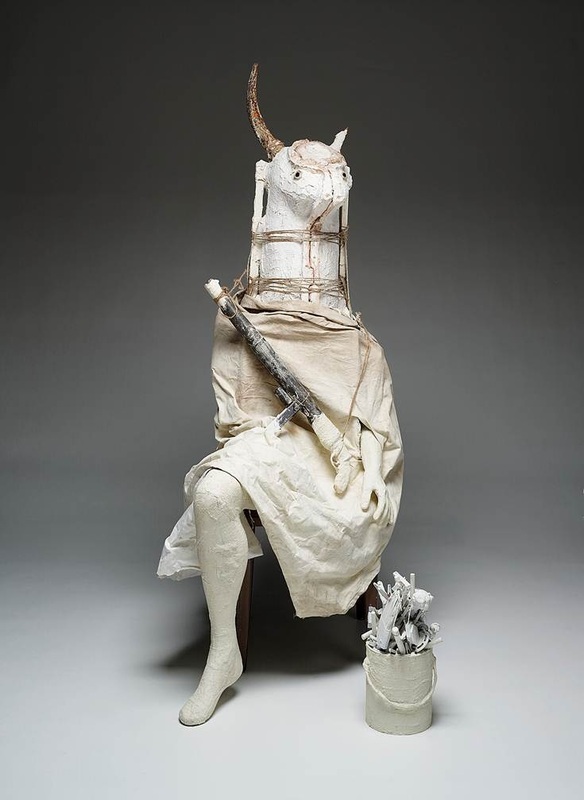 Andrea created a headpiece inspired by our new Karla Black installation. Andrea’s adorable dog Artie also wanted to dress up! 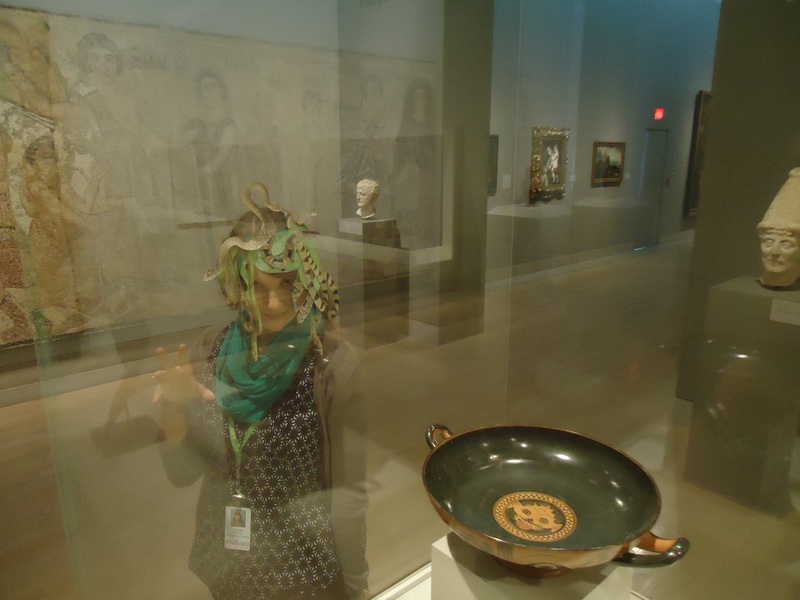 As for me, I decided to base my costume on the spooky gorgon head featured on the inside of this Black-figure kylix. In Greek mythology gorgons are treacherous female creatures that have snakes for hair and can turn anyone who looks them in the eye to stone. As educators in the museum, we get the wonderful opportunity to spend lots of time with the collection. So much so that the art works begin to feel like family. And just like in every family, there are plenty of characters. From the silly to the serious, emotional to adventurous, happy to sad, all the subjects in our collection have a lot of personality. With Thanksgiving coming up, I began to wonder what it would be like to have all of these quirky individuals come together for a Thanksgiving feast. Naturally, there were some I would be more excited about having in my home than others; after all, there’s a black sheep in every family. So I decided to ask the other authors who in our collection they would invite to Thanksgiving dinner? 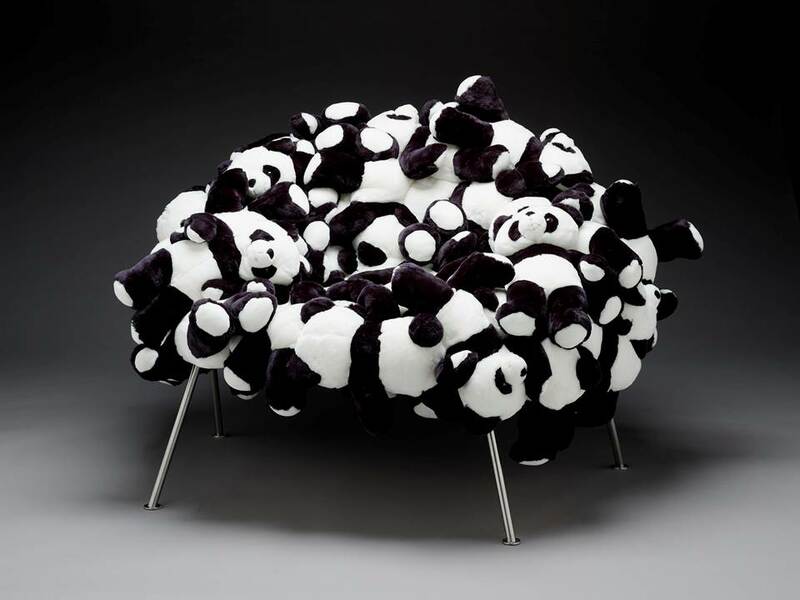 I would welcome the Banquete chair with pandas to my Thanksgiving dinner. I imagine this lovely lady to be so warm, playful, and inviting, that she’d be sure to get along with everyone. Also, if we ran out of seats at the table, I just know she would offer up herself. I would invite the Indonesian couple from the video installation The World Won’t Listen by Phil Collins. Not only do they sing one of my favorite songs by The Smiths – There is a Light That Never Goes Out – but they also seem like they would be really cool people. 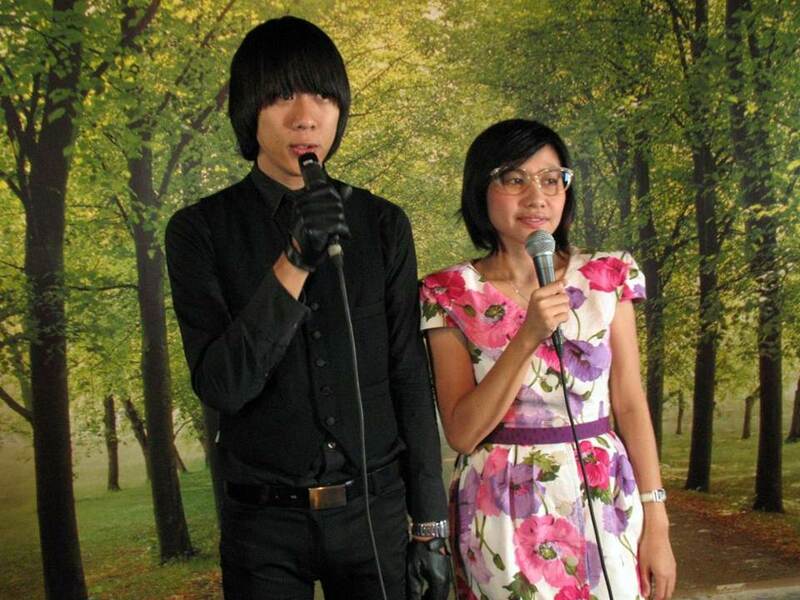 I like their style, and I love the way they sing this somewhat dark love song as a duet. 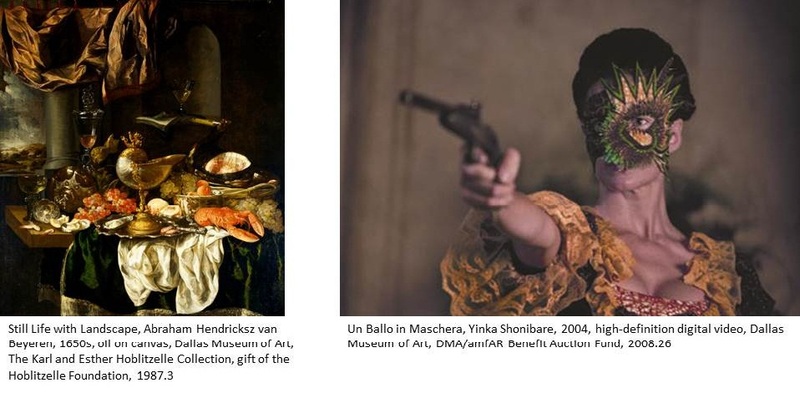 I’d invite Still Life with Landscape for dinner, and Yinka Shonibare’s Un Ballo in Maschera for dramatic entertainment. 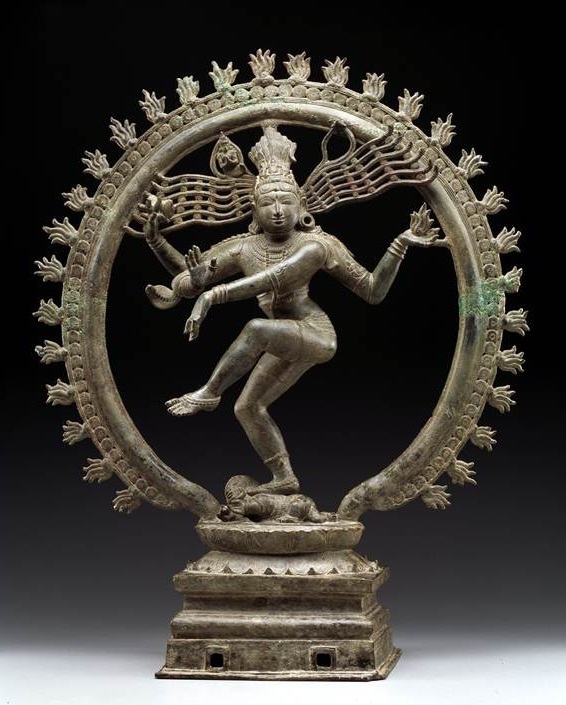 I think that I would invite Shiva Nataraja because he would be the best at passing around my favorite Thanksgiving dishes with all those arms! 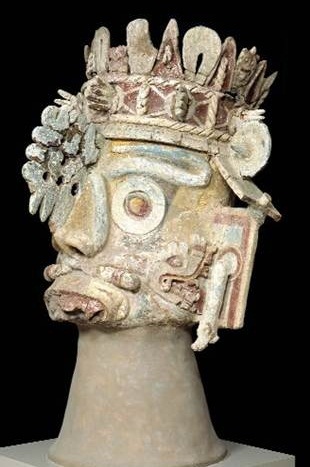 I don’t know who I would invite to Thanksgiving dinner, but I can tell you who I wouldn’t invite: the Xipe Impersonator. He wears the flayed skin of a sacrificial victim until it rots off, and I wouldn’t want his stench overpowering the yummy smells of turkey and pumpkin pie! I would invite That Gentleman in Andrew Wyeth’s painting. That Gentleman reminds me of my grandfather: someone who was oftentimes quiet, but when compelled to speak, his words were profound. I can imagine the interesting stories he would tell about his life, and maybe even past Thanksgivings. It would be an honor to share stories and a Thanksgiving feast with That Gentleman, for that is what Thanksgiving is all about, sharing. As for me, I would invite The Reveler. As the life of the party, this goofy fun-loving party animal would keep all of my guests dancing, laughing, and having a good time. Wishing you a yummy Thanksgiving! Many people have asked me, “How do you plan Arts & Letters Live?” Here’s a glimpse into the process of how we “produced” this year’s series. In July DMA colleagues Helen Seslowsky, Katie Hutton, and I spent five days in a very hot and humid New York meeting with nearly forty publicists from all the major publishing houses to learn the scoop about new book releases on the horizon for 2011. When we got back to Dallas, we met for about twelve hours to prioritize our wish list of authors and brainstorm about books whose themes resonate with the Museum’s upcoming exhibitions and collections installations. 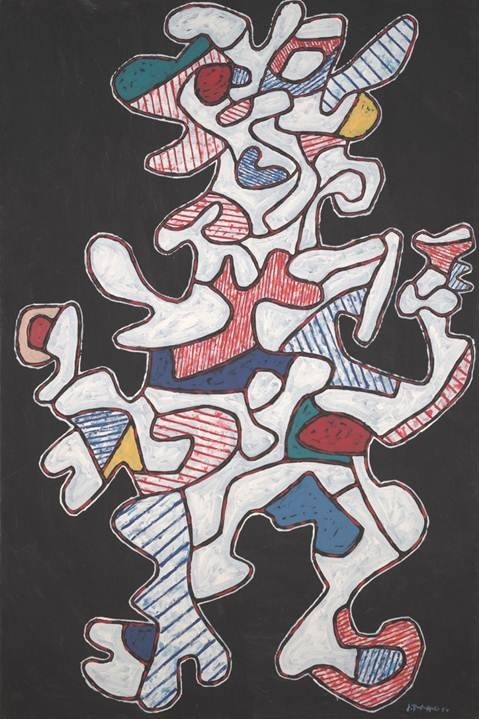 For example, Mexico’s renowned novelist Carlos Fuentes is coming to speak while the exhibition Tierra y Gente: Modern Mexican Works on Paper is on view. In March two biographers will share new insights into the lives of artists Lee Krasner and Amedeo Modigliani, both of whom have works in the Museum’s collections. Throughout the year, we also travel to hear authors speak at several prominent book fairs—the Texas Book Festival in Austin, the National Book Festival in D.C., and the New Yorker Festival in Manhattan—to discover which authors speak as beautifully from the stage as they do on the page. I heard Annie Proulx, Simon Schama, Pico Iyer, Gary Shteyngart, and others at a variety of these festivals while planning the 2011 season and knew I wanted to pursue them. 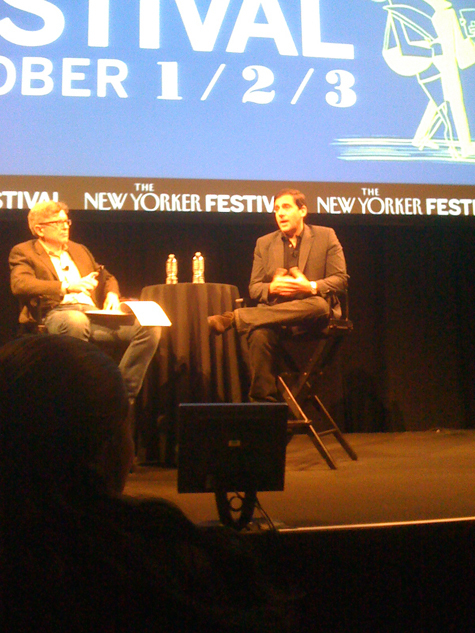 From my front row seat at Steve Carell's interview with Tad Friend at the New Yorker Festival. At the 2010 festival, I also heard authors Tobias Wolff and Mary Karr, E. L. Doctorow, Atul Gawande, Yo-Yo Ma in conversation with Alex Ross, and Simon Schama and Annie Proulx -- both of whom we're bringing to Dallas as part of the 2011 season! And because we want a season of events that will appeal to many people, we book (pun intended) a balance of fiction, nonfiction, memoir, poetry, and programs that combine art forms in creative and unexpected ways. In February we’ll feature Eric Siblin, author of The Cello Suites, who will share the story behind Bach’s missing manuscript, its rediscovery, and his own infatuation with this music. To give this evening added flair, we’re partnering with the Dallas Bach Society, and their cellist Gyongy Erody will perform musical excerpts to bring this story to life. Our next step is to send out proposals to the publishers and anxiously await their responses. The process is like putting together a complex jigsaw puzzle—discerning which authors and performers are available and when. There’s been many a time when a requested author wants to come to Dallas, but he’s scheduled to be on the West Coast at the same time we want him to be here in Texas. 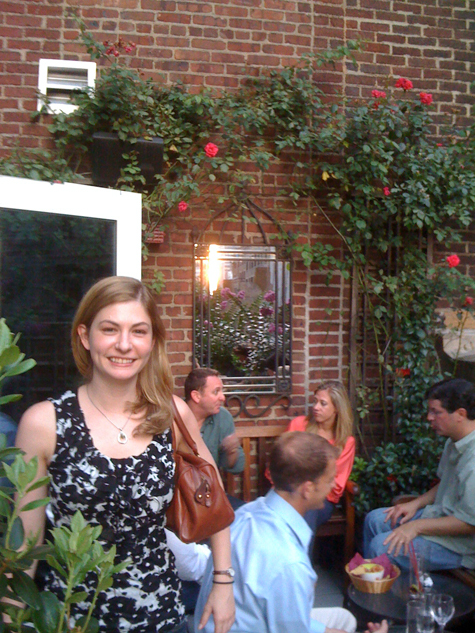 Katie Hutton (Interim Head, Arts & Letters Live) at The Library Hotel's rooftop bar after a long, but fruitful day of meetings with publicists in New York. The team enjoyed "Red Badge of Courage" cocktails! Throughout the summer and early fall, we also spend at least one day every week vetting short stories for our Texas Bound series, where Texas actors read short fiction by Texas writers. Lone Star State–connected authors from all over the country submitted nearly two hundred stories for consideration. Our team reads them and brings the strongest contenders to read-aloud sessions with our director Raphael Parry, who many people know as the Executive and Artistic Director of Shakespeare Dallas. We debate the merits and potential shortcomings of each story. Does it hook the audience’s attention and follow a cohesive narrative arc, or does it lag in the middle? What actor do we imagine bringing the story to life? Constructing a program of three or four stories is like creating a chef’s tasting menu—a short, funny appetizer followed by a hearty, more serious entrée, and finally, a dessert. Arts & Letters Live will celebrate its 20th anniversary season in 2011! I’ve been with the series nine of those years. It’s heartwarming to hear vivid recollections from many of you—what an author said to change your perspective or transport you out of the everyday. Or the “aha” moment you had in the middle of a performance combining art, music, and poetry. I hope you’ll share your favorite Arts & Letters Live moments by commenting on this post. Check out our exciting 2011 season lineup here! 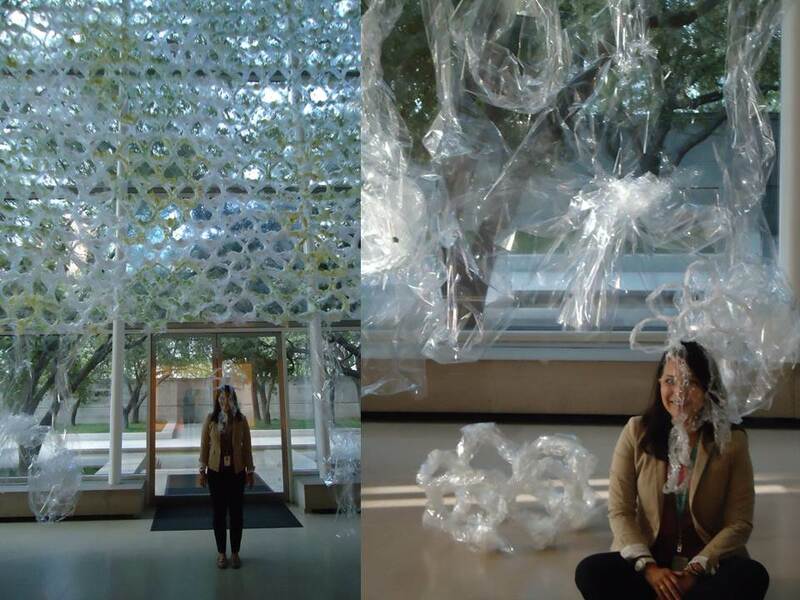 Carolyn Bess is the Director of Programming at the Dallas Museum of Art.